All quilting machines will sew and are equipped with utility stitches. This category offers a wide variety of machines. While quilting can be done on just about any machine with the help of a 1/4 inch foot and a walking foot, the purpose built quilter will have numerous desirable features not found on the basic machines. These include more arm space to the right of the needle. A standard machine has 7 inches where one better suited for larger quilts would offer 9 or even 11 inches. 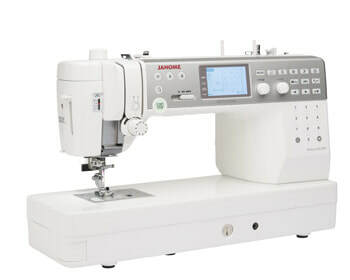 Likewise the conventional walking foot that attaches to the presser bar and is operated by the needle up and down motion is replaced by Janome's Acu feed, a superior top feeding system that moves multiple fabric layers without the possibility of shifting and puckering. A auto thread cutter that trims the needle and bobbin thread at the touch of a button is a must when working on large projects. 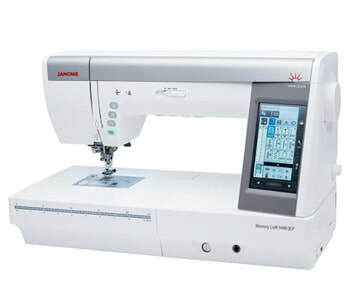 You will find all the other creature comforts on these Janome machines, such as needle up/ down, lock stitch and jam proof bobbin systems. If you are passionate about quilting, but your conventional sewing machine doesn't quite handle the job. Learn more.